Sometimes Scifi hubby sinks to new levels of geekness that surprise even me. I knew that when he was a teenager he was a huge Warhammer 40,000 fan (those strange ‘Games Workshop’ stores on the high street to those of us who had a life). I knew there was a box of little lead figures which he had painted which have been moving house with us. I knew he went through a phase of being hooked on the Warhammer 40,000 iPad game recently, but that’s harmless, right? Actually I think I vaguely knew about this. I seem to have been drip fed information that I now realise is squatting in my brain. I just hope it’s not taking up useful space that I needed for something else like remembering how to make pancakes. Oh god now I’m worried as I actually understand half of this. For those who care Logan Grimnar is the name of a person (well a Space Wolf but let’s not split hairs here). 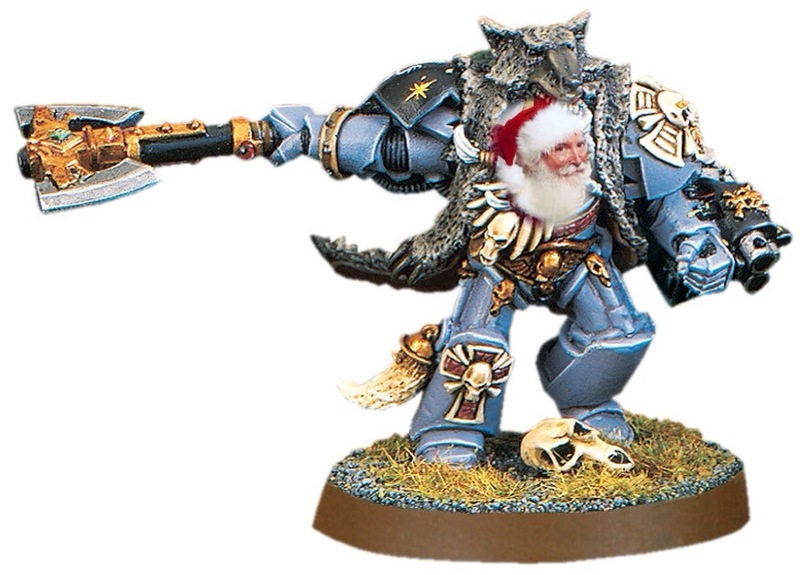 He’s the head of the army for the Space Wolves for want of a better description. Squats I hadn’t come across before but boy do I know about them now… I really must learn not to ask questions. Erm, not sure where to start on this. Is Father Christmas eight foot tall, wearing a wolf skin with superhuman powers? I hope the elves still make toys not weapons. What would become of Rudolph in such circumstances? Unlikely so I think I’m probably safe. Now it just need to make sure Scifi baby doesn’t get ‘infected’ with this nonsense otherwise I am in trouble.